Experience the arts this fall with the return of CHAW’s ARTdays , free events and workshops for the whole family! ARTdays began last year when Amy Moore, CHAW’s Director of Education and Programs, envisioned opening CHAW’s doors to the community. Throughout the year, CHAW hosts classes, workshops, concerts, and more suitable for the entire family and at no charge! 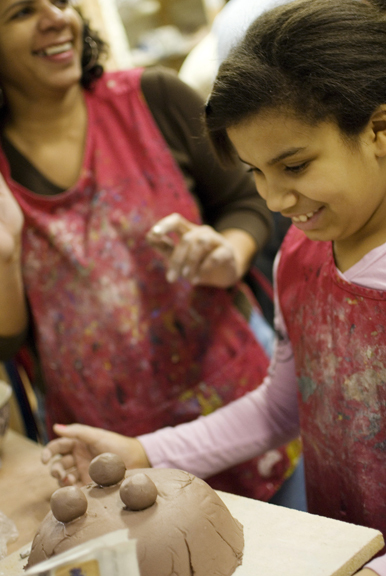 “The arts easily can and probably should be an integral part of one’s daily life,” says Amy. “ARTdays is a small contribution to the cause. Aside from that, these events give people a reason to get together with family, friends, and strangers under the umbrella of the arts in a way that can’t help but strengthen community. It’s great art, great value and great benefit all at once, “ she says. CHAW presents a happy hour to create bowls for the Empty Bowls Project benefiting homelessness and hunger relief organizations. Come prepared to get a little messy (aprons are available) and learn how to make hand-made bowls using coils, press molds, and slabs. For those more experienced throwing wheels will be available. Instruction provided. Best for ages 8 & up. Children must be accompanied by an adult. Free but reservations required at (202) 547-6839. For more information, visit www.chaw.org. CHAW presents a free Eco Art Community Garden Workshop on Saturday, September 10, 2011 from 9:30-12:30 p.m. (drop-in) at 545 7thStreet, SE. Create a garden out of recycled materials and learn about Rett Syndrome in the process. The garden will be featured at the Girl Power 2 Cure* gala later in the month. Artwork from the garden will be sent to children affected by this syndrome. Admission is free and open to all ages. Children must be accompanied by an adult. For more information, please call (202) 547-6839 or visit www.chaw.org. Two performances at 10:00 a.m. and 12:00 p.m.
CHAW hosts “Off to Lapland” from Finland as part of the Kids Euro Festival on Saturday, October 22, 2011 at 10:00 a.m. and 12:00 p.m. Puppet performer Juha from Finland takes the audience to Finnish Lapland. A mean troll lives inside a mountain. Yoik music and mountains and the adventure is ready. Admission is free and open to all ages. For more information, please call (202) 547-6839 or visit www.chaw.org. CHAW presents a Community Drumming Circle on Saturday, October 22, 2011 from 4:00-5:30 p.m. Explore improvisation, call and response, share rhythms and dance if you feel like it. Additional drums and percussion instruments will be available. Admission is free and all ages are welcome. For more information, please call (202) 547-6839 or visitwww.chaw.org. Two performances at 10:00 a.m. and 11:30 a.m.
CHAW hosts “Step by Step-Journey of Life” from Germany as part of the Kids Euro Festival on Saturday, November 5, 2011 at 10:00 a.m. and 11:30 a.m. Simple steps become lively and magical games, dances and short stories that bring the world to the audience’s feet in this performance from Germany. Admission is free and open to ages three and up. For more information, please call (202) 547-6839 or visitwww.chaw.org. CHAW presents The Singing Lizard on Saturday, December 3, 2011 from 10:00-11:00 a.m. The Singing Lizard’s live shows are fast-paced, fun, and full of exciting songs that both kids and adults enjoy. Admission is free and all ages are welcome. For more information, please call (202) 547-6839 or visit www.chaw.org. For a complete list of workshops, classes or registration information, please visit CHAW’s website at www.chaw.org or call (202) 547-6839.